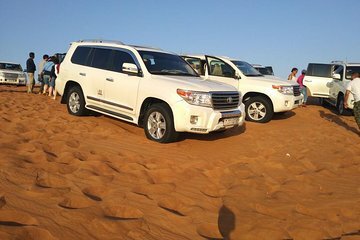 Escape the glitz and glamour of Dubai and head out into the nearby sand dunes with this exhilarating experience. You'll get to participate in a host of desert activities, with the option to try a shisha (tobacco hookah), ride a camel, try on local dress, or get henna painted on your hands. You'll also watch live belly dance performances and get to enjoy an open-air barbecue dinner.